Seventy Six days after being judged by the Guinness Book of Records, the Hexagon Quilt went under the Scissors and the Rotary cutters today. 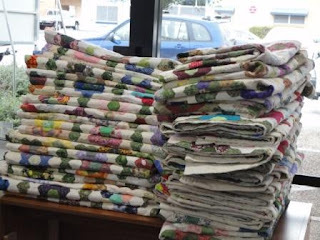 Three hours and 115 quilts later it is now in manageable portions ready to be bound for distribution to various groups. This is just a small proprtion of the Lap Quilts that were cut from it. Still waiting to be bound.